Createspace Independent Publishing Platform, 9781481034937, 112pp. Why do some books sell a few copies and then languish, why others go on to sell tens of thousands? In a word: Marketing. 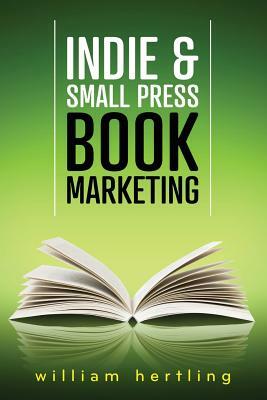 Indie & Small Press Book Marketing explains how to market your book, with a detailed plan for what you need to do before launch, during the all-critical launch month, and afterwards. Full of proven techniques to get initial sales and reviews, increase conversion rate of your blog and Amazon page, engage with communities of passionate readers, and connect with influencers and reviewers who can help launch your book into bestseller lists. "Finally, a structured approach to marketing books." - Tonya Macalino, author of Spectre of Intention and The Shades of Venice "Even for the traditionally published author, this book is full of great stuff It takes a detailed, easy to follow approach to promoting your book. Highly recommended " - E.C. Ambrose, author of The Dark Apostle series "Chock full of actionable marketing tips I wish I'd known years ago." - Gene Kim, author of The Visible Ops Handbook and The Phoenix Project: A Novel About IT, DevOps, and Helping Your Business Win. William Hertling is the author of the award-winning Avogadro Corp: The Singularity Is Closer Than It Appears and A.I. Apocalypse, near-term science-fiction novels about realistic ways strong AI might emerge. His books have been called "frighteningly plausible," "tremendous," "must read," and both have been Amazon top five bestselling technothrillers. Avogadro Corp won Forewords Review Science Fiction Book of the Year and A.I. Apocalypse was nominated for the Prometheus Award for Best Novel. He's been influenced by writers such as William Gibson, Charles Stross, Cory Doctorow, and Walter Jon Williams. He currently resides in Portland, Oregon. Follow him on twitter at @hertling or visit his blog http: //williamhertling.com.